In the process of making your eyebrows look better while growing in, it’s the little things that make a difference. Remember, it’s what you keep that matters, not what you take off. 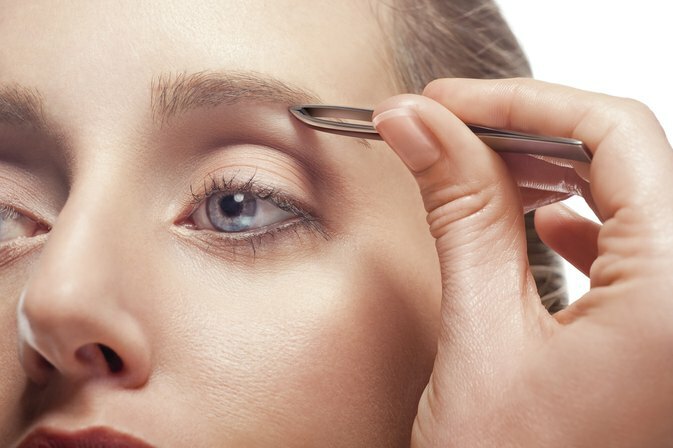 So when you’re trying to get your brows to look better in the meantime, try these little fixes to make them look a lot better in the process. HOW DO YOU CLEAN UP YOUR BROWS WHEN YOU’RE TRYING TO GROW THEM IN? To make your overly tweezed eyebrows look better, try by just trimming them. Put the tweezers down and see which hairs are way too long. Start by brushing the hair up and slightly sideways with a clean mascara wand. Take your manicure or brow scissors and very lightly, trim just 1 hair at a time. Not across. Not a bunch at once. Just one. The trick is to trim them to slightly above your brow. Not all the way down to the brow line. Just above by 1/4″. That’s it. Brush them back into place. If you want your brows to look thicker in the meantime, that’s where brow makeup comes into play. I’m always amazed at how many clients want great eyebrows, but they don’t want to do anything to make them look better in the meantime. The goal is to go soft and lighter than your actual brow hair. Here are 3 types of brow makeup you can choose from. Brow Pencil.Pencils are great if you have a lot of spaces and gaps still trying to grow in. Choose a shade that’s 1 shade lighter than your brows. This allows your eyebrows to look softer, shaded in, and more natural looking. Painted on is so yesterday. Brow Mascara. Looking for the most natural looking brow makeup you can do? Brow mascara is the trick. Pick a shade as close to your brow hairs as possible. 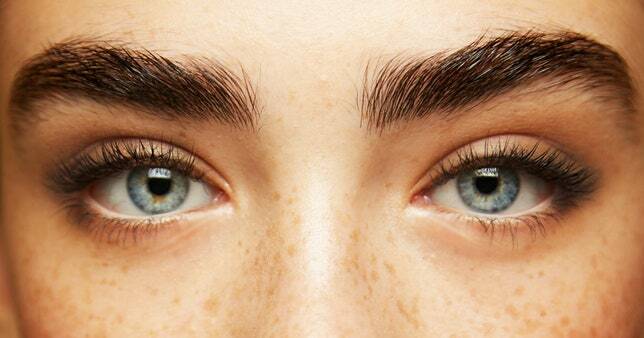 A brow mascara will pick up the newly growing in and lighter hairs . It does a great job in making brows look thicker and fuller because you actually see all the hairs you have growing in. Instant perfection. Brow Powder. This is the softest brow makeup you can do. Go softer, lighter than your hair color and try to think of your shadow as just that, a shadow. Fill in only where needed and buff and blend with a super soft spoolie brush. If you’re really trying to get your brows back, the fastest way is to put away the tweezers. Seriously. The clients that do that, get their dream brow so much faster than those who “clean up” every week. Why? Even though you’re ‘cleaning up’ most tend to go too far and take out hairs that could work into the growth process. The more you take out, the more time you are adding to your growing in time. But what if you have a big event, a hot date…. your brows need to look perfect. Then grab a slanted tweezer and ONLY, I mean only tweeze away 1 to 2 rows from the bottom of the brow. And only those. Keep about 2 rows messy below the brow because that’s most likely where you want them to grow in. Or as my mom used to say, “just tweeze the obvious ones”. The ones you know without a doubt they don’t belong. But the key is to stop once you’ve done that. Don’t keep going, If you keep fussing, keep tweaking… it won’t work and you’ll end up with thinner brows. It usually takes about three to four weeks for 1 cycle of hair to grow back, and in extreme cases, it’s very common for eyebrows to take over a year. On a good note, it takes decades of serious hair removal to stop brows from growing back at all. But roots do get damaged with all that pulling. Hairs that are damaged you can tell, because those hairs are thinner, finer and lighter in color than your regular brow. Good news, a damaged root can still grow. Bad news, it takes a lot longer than usual to grow back. If you see those, keep them. You can save them with a colored brow gel to show them better, or a professional brow tint. Add some color and your brows will look instantly thicker. Not sure your brow makeup is the right color? After you do your foundation, concealer, powder routine, then apply your brow makeup. You want to make sure there’s no other color on the face. Once the brows are done, if they look natural, and not too dark and over drawn, it’s perfect. Your brows will look great in any setting or lighting. If you do your brows last, most people tend to make them darker to match the rest of the colors on the eyes and lips. Sometimes that can look way too overdone. Just do the brows first.